Large family vacation home with panoramic views and swimming pool. Summer Tides is a large, well equipped self catering family home that can accommodate up to 15 people. 6 Bedrooms well spaced apart and cleverly fitted for families with children. 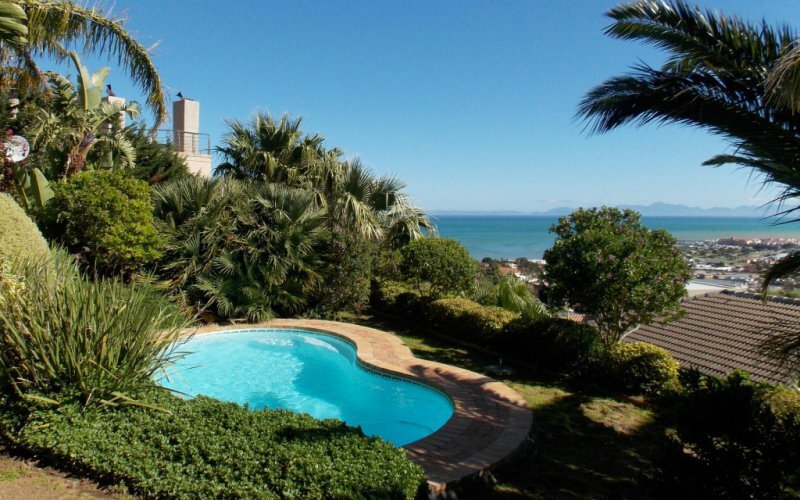 Summer Tides is a tastefully furnished, spacious 4 bedroom vacation home situated on the Mountain side of Gordons Bay. The main living areas and patio boast boasts mesmerising views with panoramic vistas over False Bay. And once the sun has gone down in its entire magnificent African splendour, the romantic night lights over the Helderberg continue the magic. Built on two levels, this home offers space and comfort for large families and groups of friends in search of a stress free getaway. The top floor houses a lounge with Big screen tv, fire place and comfy couches. Its sliding doors open onto the undercover balcony, with Weber barbecues and outdoor table. The dining area is adjacent to the spacious modern kitchen, also with sliding doors opening onto the same spectacular view and balcony. The master bedroom is wonderful; it has a large full en-suite with oval bath tub, shower and a walk in wardrobe. Big corner windows overlooking the whole of False Bay. Down stairs are 3 bedrooms which can sleep 8 people. The fourth bed room is romantic and private with an en -suite bathroom and kitchenette. This suite can be rented out separately and sleeps 2 people. The entire house sleeps 12. We also have an independent cottage on the premises that sleeps 3.